You’ve sipped the tequila sunrise of Arizona, but now it’s time to cruise on over to the home of the auto industry and Motown. Michigan is known for many a few flavors, like the gentle, syrupy taste of Vernors ginger ale or the crisp, tart snap of a Michigan cherry. But up around the boat town of Bay View, Michigan the most famous flavor is an ice cream drink called The Hummer — a classic Michigan cocktail invented by bartender Jerome Adams in the ‘70s at Bayview Yacht Club. [caption id="attachment_4580" align="alignnone" width="764"] Photo Credit: AmazonAWS[/caption] In 1978, young Jerome Adams replaced the resident bartender at Bayview Yacht Club, who had tended bar for 28 years. In an attempt to prove himself to the Yacht Club regulars, who used to sit at the end of the bar, Jerome began experimenting with different flavors when he landed on a creamy concoction of Kahlúa, rum, and ice cream one night. Ed Jacoby, owner of Jacoby’s downtown, happened to be there that evening and asked Jerome if he could try it. He loved it, and when he asked the name, Jerome said he didn’t have one yet. One of the guys in their group said after two of them, it “kind of makes you want to hum.” And a name was born. 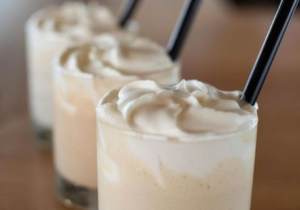 It became so popular that soon the Bayview Yacht Club was receiving calls from around the world with bartenders asking for the recipe for the creamy adult milkshake. England barkeeps even started calling it the Detroit Hummer. Jerome, now 76, is still mixing his famous Hummer at special events and Michigan residents are forever thankful for his ingenuity. Now let's get to the recipe! Ingredients 1-1/2 ounces rum 1-1/2 ounces Kahlúa 2 scoops vanilla ice cream A couple ice cubes Directions Blend all ingredients and serve in a small rocks glass. A Minty Twist: The Mint Patty 1 ounce green creme de menthe 1 ounce white creme de cacao 2 scoops vanilla ice cream Directions Blend together for a frothy adaptation of the Hummer. For a real Metro Detroit twist, garnish with a few pickled Michigan cherries on top!